OGDEN, Utah – Seventh seeded Maine’s national championship run continued with its Division I FCS quarterfinals win over two-seeded Weber State 23-18 in front of 7,726 in attendance at Stewart Stadium. Ramon Jefferson scampered 45 yards for a touchdown with 2:56 left and a Jaron Grayer interception set up by Kayon Whitaker’s deflection of a Weber States quarterback Jake Constantine pass enabled Kenny Doak to kick a game-clinching 46-yard field goal with 1:22 left. That made it 23-12 and the Wildcats scored a consolation touchdown on the final play of the game. The Maine (10-3) defense displayed its toughness as the Black Bears limited the Wildcats to 271 yards of offense and -1 rushing yards. Maine entered the contest ranked ninth in the FCS in total defense (295.3 yards/game) and second in rushing defense (74.5). “We came out with intensity and violence from the start,” said Maine senior linebacker Sterling Sheffield. Maine advances to the FCS semifinals for the first time in program history after making its fourth quarterfinals appearance. Neither team managed to do much of anything in the first quarter. They mustered only 101 yards combined, and both the Wildcats and Black Bears punted three times apiece. Weber State (10-3) struck first with a Trey Tuttle converted a 37-yard field goal on the second play of the second quarter. Maine recorded its first score just before halftime when Craig Ferguson found Jaquan Blair on a quick out and Blair was able to dive over the goal line. Following a booth review, the play would stand as Maine entered the half with a 7-3 advantage. 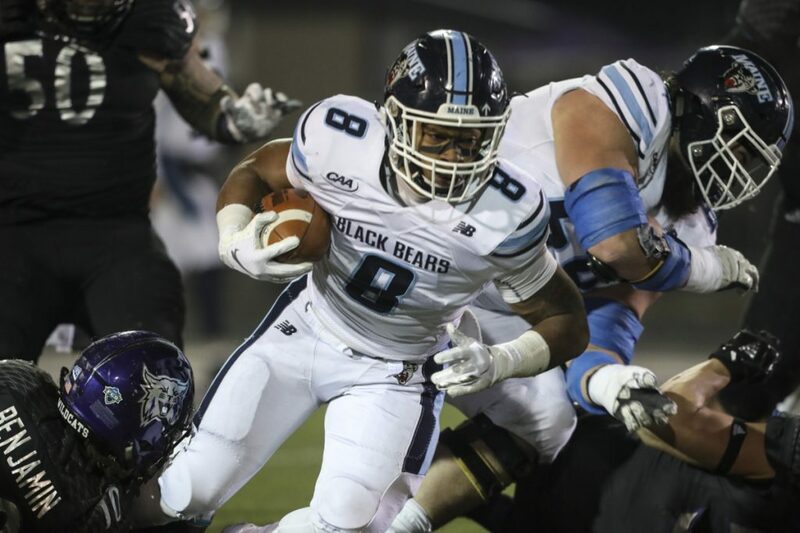 At the start of the third quarter, Maine struck for its secondtouchdown in the first two minutes of the third quarter as Ferguson foundEarnest Edwards for a 67-yard strike to give the Black Bears a 14-3 lead. Weber State answered on its next drive with Tuttle connecting on a 45-yard field goal for a 14-6 contest. On the next Weber State drive and facing a fourth-and-12 from the Maine 33, Constantine heaved a pass into a scrum of players that was originally ruled an interception by Jeff DeVaughn in the end zone. But after a booth review, the Wildcats’ Devon Cooley was awarded a touchdown. After a missed extra point kick try, that made the score 14-12. Turnovers doomed Weber State late in the game with the Wildcats throwing four interceptions, three coming in the fourth quarter. Devaughn led the Black Bears with two of those takeaways. Following Jefferson’s touchdown, a missed extra point by the Black Bears kept Weber State alive, but the Wildcats’ fourth interception of the game allowed Maine to begin its drive on the WSU 29-yard line to set up a 46-yard field goal for Doak. Weber State added a score as the clock hit zero with Constantine finding Darryl Denby for a 12-yard reception to make it a 23-18 final. Weber State, again, drops a quarterfinals match-up after falling in the same round a year ago to James Madison, and kep the Wildcats out of their first-ever semifinals game. The Black Bears will face the winner of UC Davis/Eastern Washington, which is set to be played tomorrow in Cheney, Wash. The Aggies or Eagles will host Maine next week with a trip to the Division I FCS Championship on the line. The game date and time to be determined.